These days you can get to most places if you are happy to combine a few frustrating bus journeys, maybe a taxi or a long train ride. However if you plan on visiting any of these lesser known attractions in Australia, it will make your life easier if you have your own set of wheels. VroomVroomVroom can help you find a rental car at an affordable rate so you can explore these destinations and more. We compare prices from Australia's top hire car companies, and can offer you the lowest prices on vehicles. Here are a few great spots in Australia, located off the main highways and hidden away in incredible landscapes. 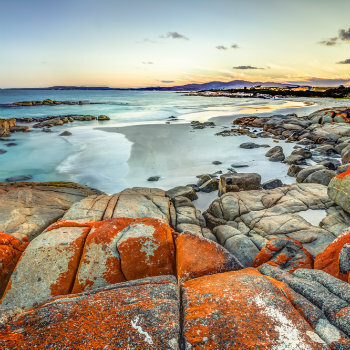 The beautiful Bay of Fires stretches more than 50km on the east coast of Tasmania. Public transport is limited in the region so it is perfect for exploring with a rental car. With many miles of beaches to explore, visitors will not be short of things to do. The area is known for the fiery red colour of the rocks on the beach and the clear waters. The beaches are ideal for snorkelling, and there is a wealth of wildlife to discover. Start your Tasmanian adventure in Launceston, where you can pick up a car and head to the Bay of Fires. There are many small towns to explore along the way with accommodation to help you break up your journey. Nestled among acres of bushland, the crystal-clear waters of Bitter Springs is like something out of a fairytale. There are walking trails throughout the area to help you better enjoy the views of the surrounding plants and wildlife. Those who visit the springs can relax in thermal waters that maintain a constant temperature of more than 30 degrees. The site also offers a nearby caravan park and cabins if you plan to stay overnight to see more of surrounding Elsey National Park. Bitter Springs is located just outside of Mataranka. You can pick up a rental car in Katherine, which is just over an hours drive from Mataranka, or include it on a longer roadtrip from Darwin. A trip to Silverton is like going back in time. The town makes for an interesting stop on an Australian roadtrip, having served as a backdrop for many international films such as Mad Max. Much of the old architecture is still in tact, and many of the buildings now function as museums. Follow the walking trail through the town and learn about the history of the area. Visit the Silverton Gaol and Historic Museum to see artifacts and get a window into life in Silverton. Don't miss the nearby Mundi Mundi Lookout for amazing views across the vast outback. Silverton is a 30 minute drive from Broken Hill, and over a six hour drive from Adelaide. VroomVroomVroom can help you with car rental in both these locations. There are a range of accommodation options offered in Broken Hill to give you time to explore more of the area's attractions. Secluded in Gulf Savannah Country, the Undara Lava Tubes offer visitors a memorable experience in Queensland's outback. Visitors can follow the path of lava flow from ancient volcanoes, and witness the effect it has had on the land. Choose from a number of informative tours and explore different sections of the area, learning about the history, flora and fauna. Keep an eye out for interesting events held at Undara, and stay in the unique accommodation offered on site. Undara is located 260km from Cairns, with the route crossing the scenic Atherton Tablelands. It is the perfect destination for a drive in Far North Queensland. Pick up your rental car in Cairns and start exploring this unique part of the world. 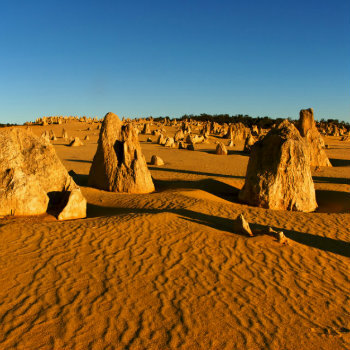 To experience a landscape like you've never seen before, visit the Pinnacles Desert and explore the fascinating region. See the limestone rocks scattered throughout the desert, millions of years old. There is a discover centre nearby providing information on the history of the area and formation of the limestone structures. Scenic trails allow you to walk through the sand and experience the Pinnacles up close. Although coaches are offered to the area, picking up a hire car from Perth will give you greater flexibility to enjoy the Pinnacles at your own pace, as well as visit some of the surrounding attractions like the town of Cervantes or Lake Thetis. This Australian National Heritage listed site contains a huge amount of natural attractions such as mountains, waterfalls, and unique Australian wildlife. The site is also known for its cultural significance, with many opportunities to see Indigenous artwork throughout the national park. There is an abundance of walking trails for hikers of all abilities, including trails that ascend into the mountains offering splendid views over the countryside. The Grampians National Park is easily reached with a rental car, with Melbourne located just over a three hour drive away. For an incredible view in some of the most remote country, don't miss the Bunda Cliffs in South Australia. Stretching for more than 100km, the cliffs make for a dramatic view of the sparse Australian outback meeting the Great Australian Bight. The region is very remote, and there are many opportunities to view the cliffs while travelling across the Nullabor Plain. The township of Ceduna offers car rental, or alternatively pick up a vehicle from Adelaide and drive over a thousand kilometres across Australia's vast outback. Have you ever travelled to any lesser-known destinations in Australia? Let us know some of your favourite destinations.